Hello everyone! 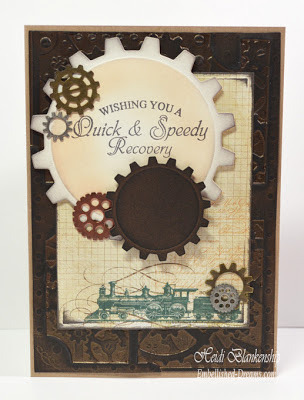 Today, I have another project to share with you using one of the New Release stamps sets from JustRite Papercraft. 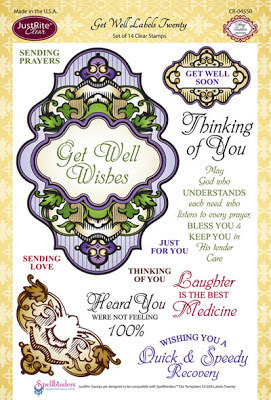 This is the new stamp set--CR-04550 Get Well Labels Twenty. 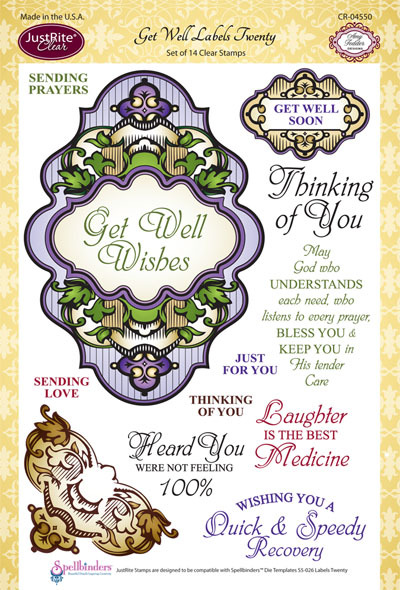 It matches Spellbinders Paper Arts® Labels Twenty die template and it has several sentiments included. Here is the card that I designed using one of the sentiments from the CR-04550 Get Well Labels Twenty stamp set. I wanted to make a masculine card and I thought the sentiment worked really good with the cogs and the image of the train on the pattern paper. Using Memento Espresso Truffle ink I stamped the sentiment on to Simply Smooth Ivory paper. Then I used S4-386 Cogs die template to cut/emboss the shape and I used Desert Sand ink to ink the inside edges of the die cut. I also die cut another cog shape and added metal gear pieces to use as embellishments. Here is a close up look at the pattern paper from My Mind's Eye and the embossed detail from the E3D-002 Creative Cogs M-Bossabilities™ folder. 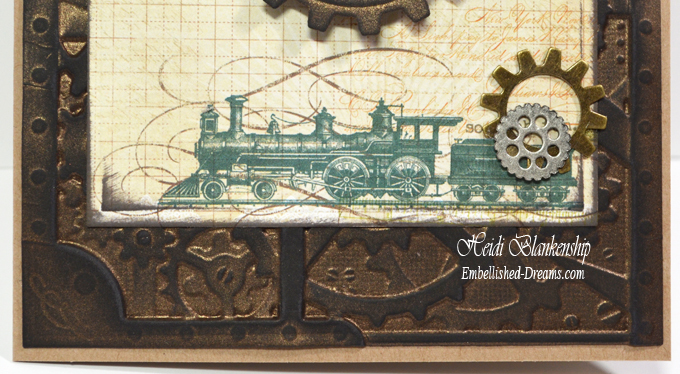 I used Bronze metallic paper for the embossing and then I lightly sanded it to reveal the dark core of the paper. 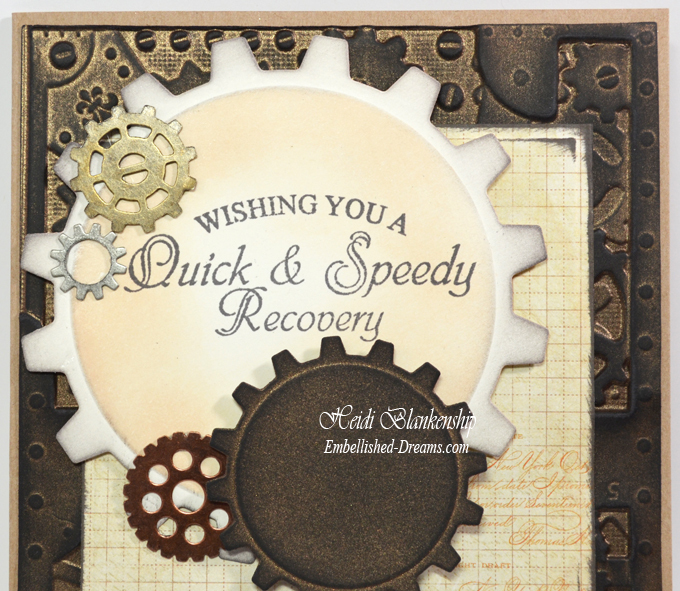 This is a great masculine card that could be used for several occasions just by simply changing out the sentiment. Please be sure to visit all of the JustRite Papercraft Deign Team Members to see what they have created to share with you. 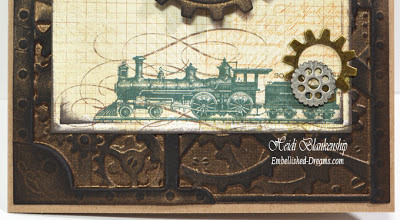 Very nice Heidi I love the one with the train on in particular nice idea for a male card! Crafty Hugs from across the pond!